We are used to drawing a line between urban and rural areas, thereby putting them in opposition. However, cities embrace nature, too, featured by greenery, birds, small animals and even flowers in boxes. We want to increase natural presence in urban areas and involve urban dwellers in creating a more favorable urban environment, and thereby improve the living standards. The city is ready to change. Bow&String, a cello duo, made the musical opening of the event happen. 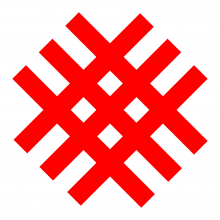 The logo of the new urban festival KAMAYEDZITSA symbolizes a sown field or land in blossom, and this is for a good reason: the festival is intended for creating a community of people interested in growing edible plants and increasing urban biodiversity. 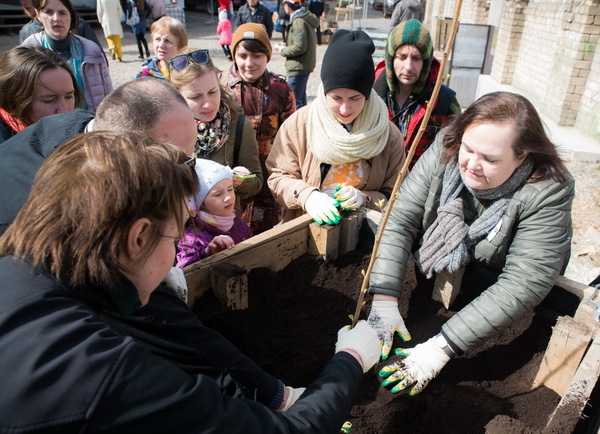 That is why exchanging seeds and seedlings became the festival’s highlight. 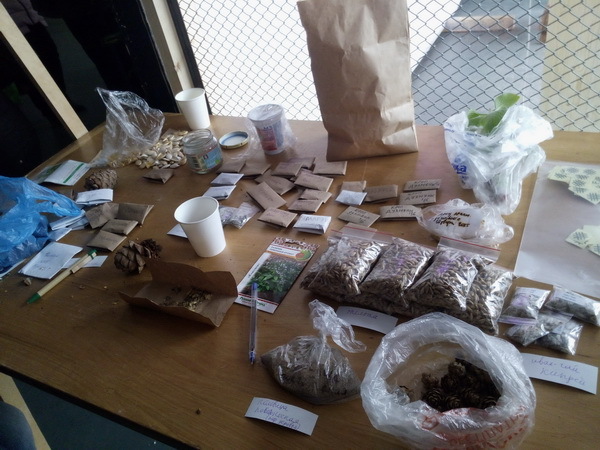 People queued in front of the table with labelled paper packages during the whole day, as at the beginning of the season everyone wanted to find seeds to plant. 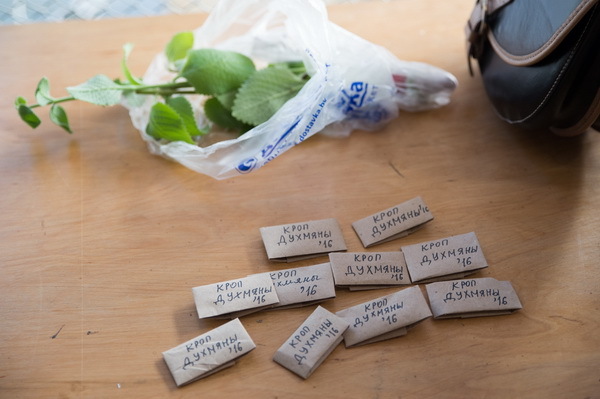 Volunteers hardly managed to pack the seeds brought by KAMAYEDZITSA’s guests. It appears that exchange of that kind will soon become a regular component of various events, just the way book exchange and waste paper collection did. 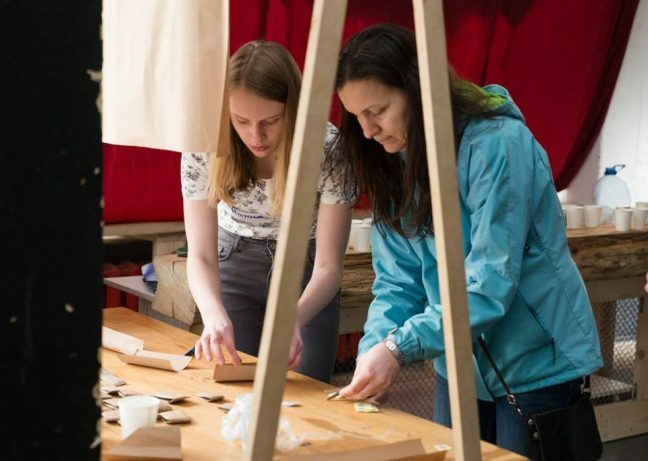 When the seed exchange was over, the visitors moved on to explore what was offered at the fair. Items offered for sale in the open air included nurslings of trees and shrubs, seedlings and goods produced from herbal raw materials, from tea to handmade cosmetics. Farmers, permaculture agriculturalists and representatives of ecovillages brought the fruit of their labor to the fair. There was a truck loaded with all kinds of plants from the Institute for Fruit Growing. 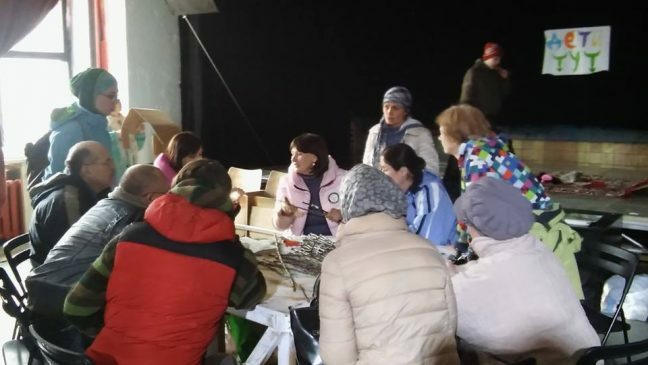 Customers were consulted on best practices in planting, differences between varieties and cultivars and the suitability thereof for specific planting conditions right on the spot. As it was quite cold, the guests feasted on ivan-chai. A workshop on engrafting fruit trees delivered by Ms. T.P. Grusheva, C. Sc. In Agriculture, a researcher from the Institute for Fruit Growing, enjoyed great attention. 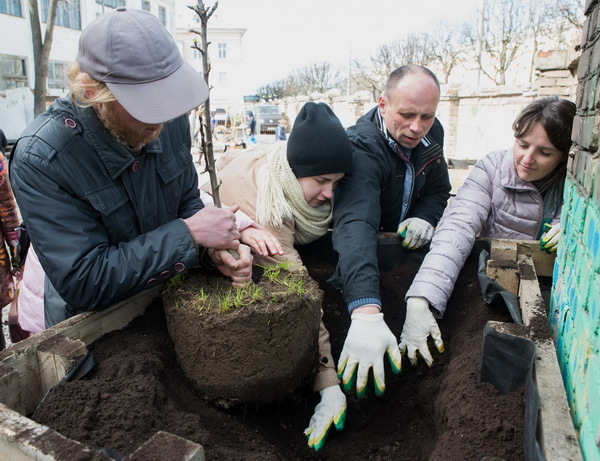 The cultural center KORPUS is planning to plant edible plants in the yard in front of the building. 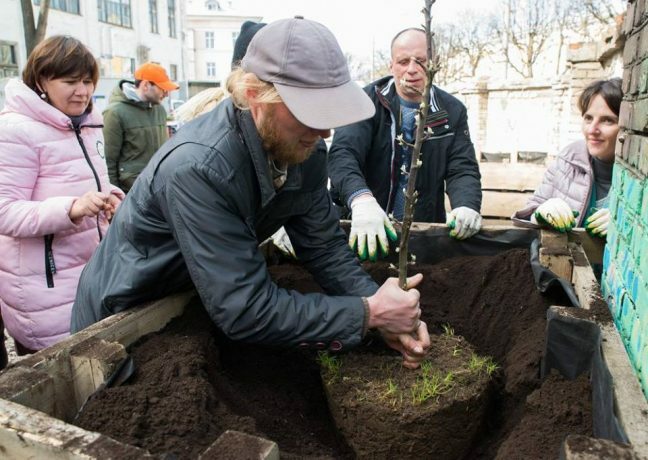 Cooperation with the Agra-Eco-Culture organization has already delivered its first fruit: during the festival, the organization’s staff planted a sakura, a columnar apple tree of the “Moscowskoye ozherelie” variety, dewberry, grapes and gooseberry. 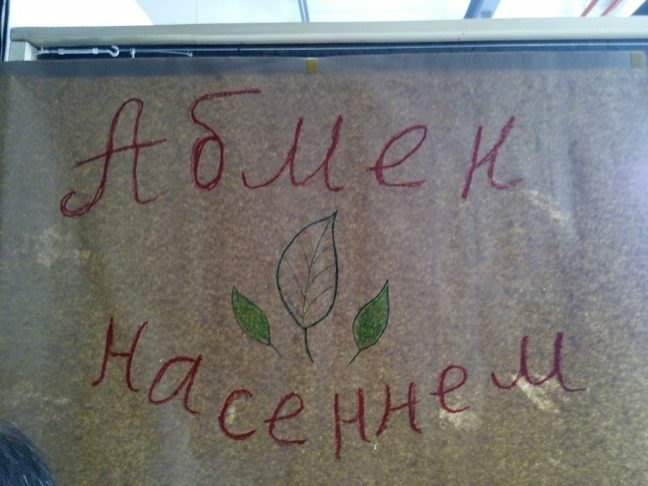 I. Khvaschevsky, an organic farmer, presented a currant bush. 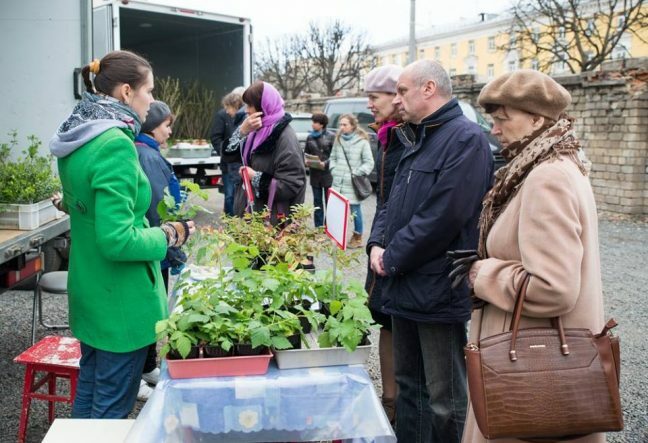 Strawberry, hyssop and other aromatic herbs brought by participants of the fair as presents to the new urban garden were planted in the lower level of containers. 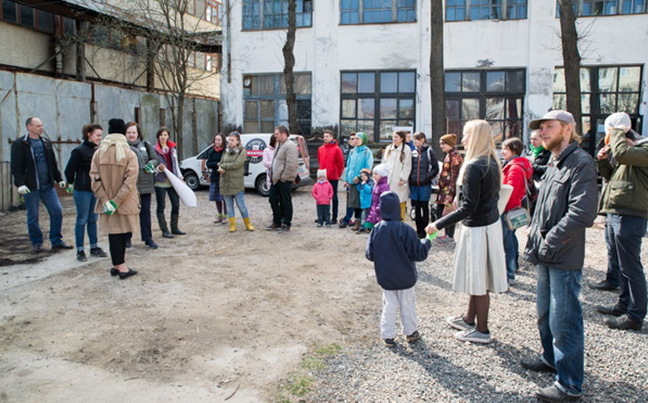 We plan to continue cooperation with the KORPUS cultural center in terms of developing the urban garden. Benches, green vegetables and aromatic herbs will soon appear in this garden, too, and then urban dwellers will have a chance to drop into a cozy spot in the center of Minsk to enjoy to have a nice time with friends or read a book. 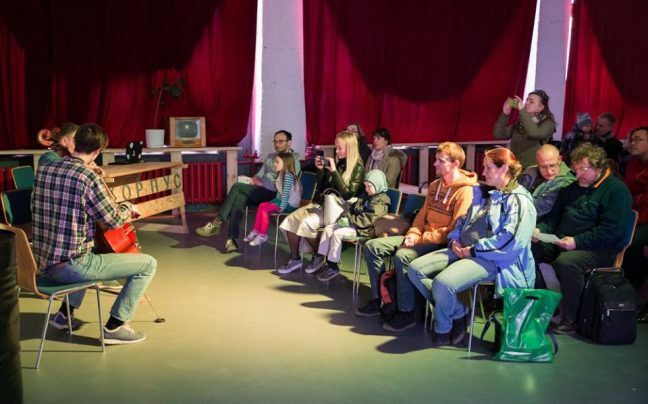 By the way, books were part of the festival, too: it featured books on organic farming for those interested in it and an exchange in children’s books. Actually, there was a lot of exchange going on in the children’s corner: there were books, toys and bonstics. 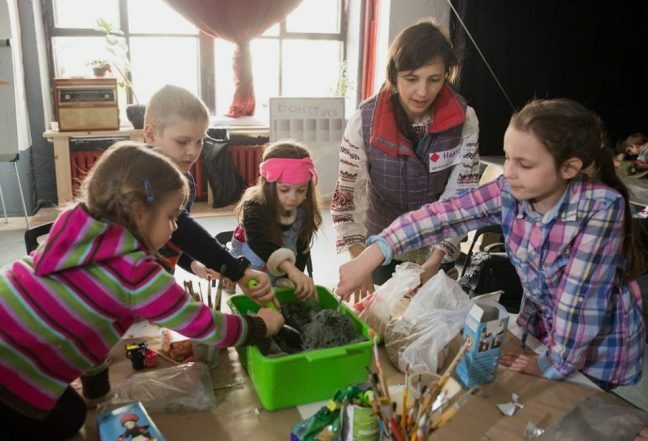 However, workshops brought about by “Dziciachiya Eka-Maisterni” (Children’s Eco-Workshops) captured most attention. The kids dealt with contamination of ground waters, made a fantastic kamayed-beetle from recyclable materials, as well as seed bombs, and dwelled on conditions necessary for the seeds to grow into plants. The adults’ agenda was packed with information, too: presentations came one after another all day long; to view the presentations, please follow the link . 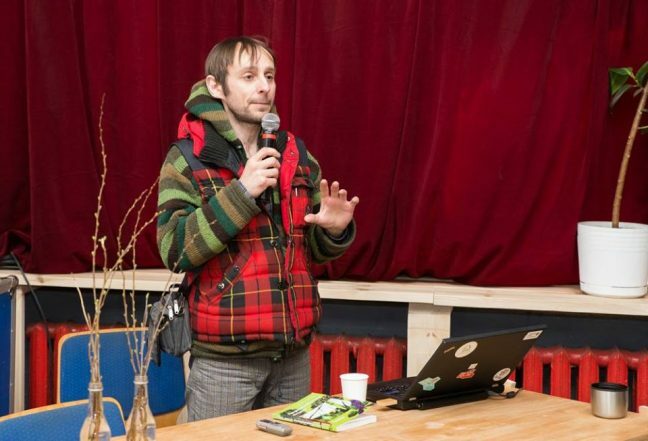 Tatyana Chuchko told about seed exchange in Ukraine, Ilya Remez spoke about the forest orchard concept and first steps towards creation thereof, and Irina Sardarova from Russia shared information about permaculture in kindergartens. 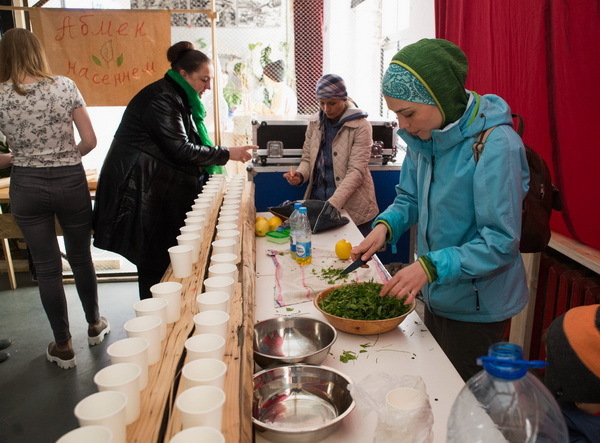 The speech about edible wild plants by Tatiana Dubkova and a taste test of a salad from the spring’s first greens were of great interest to the visitors. They also paid a lot of attention to the presentation by Svetlana Zhinkina on growing early tomatoes without green houses and the construction of an efficient green house for seedlings. 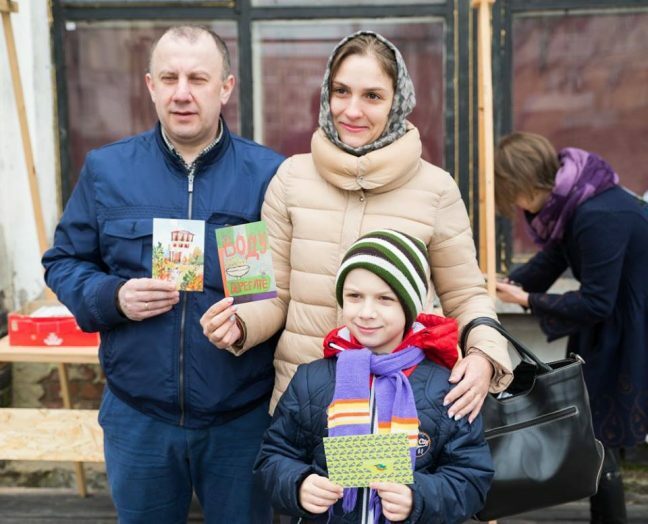 The competition for the best domestic vegetable garden was completed and the winner, Ilya Remez, was awarded a prize. 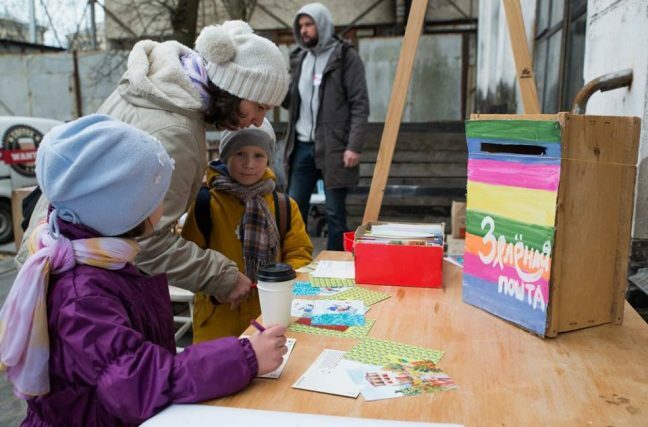 Those leaving the festival ground could use the “green mail” and send their friends and dear ones post cards with eco-friendly lifestyle tips. The festival brought together urban gardeners that plant basil and cucumbers on their windowsills, as well as keen summerfolks, who develop planting strategies for their plots for the whole season. Some dropped by to leave wastepaper and used this opportunity to explore other festival areas. Waste paper was exchanged for nurslings, strawberry seedlings and publications on organic farming and permaculture. 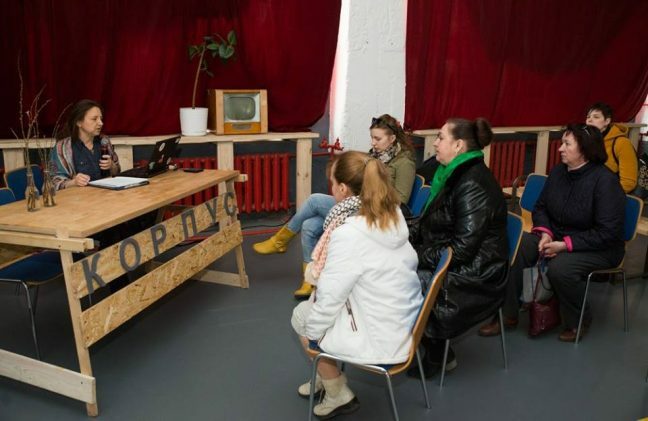 Alongside with that visitors could get exhaustive information on the status of waste treatment in our country from Pavel Kovshel, trainer of the School of Environmental Activists under Green Network. 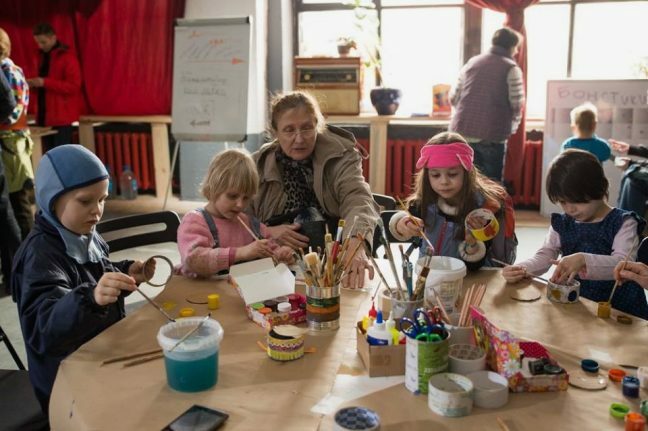 Exchange was so popular at the festival for a good reason. Exchange of any sort, outside the economic relations, enables people to establish personal contacts and interact with each other. It is one of the elements that helps build a community. 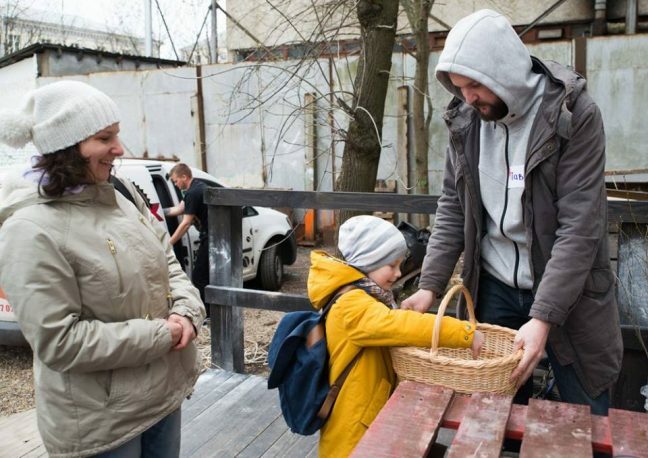 We hope that a foundation for the Minsk community of urban gardeners has been laid. 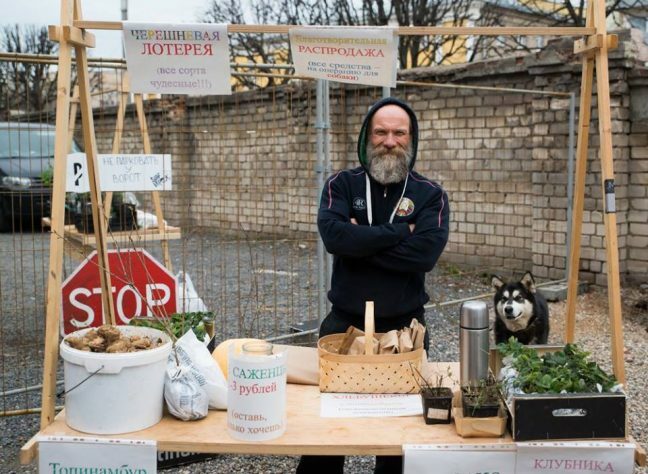 The KAMAYEDZITSA Urban Festival was organized by the NGO Agro-Eco-Culture together with the Eka-Maisterni, PA “Ecohome” and “Permaculture Sweden”.